And yeah, you're good to go for the first scenario! So, in Dawn of Peacemakers, generally you're trying to fulfill one scenario: you need to get both sides' Motivation to drop below 2. When that happens, each side is ready to withdraw, and only a simultaneous cessation of hostilities is considered a victory for you. If you mess up and either side hits 0, they surrender, and you lose. It is unlikely but possible for you to somehow have both armies surrender to each other simultaneously, which is ... still a loss, but a more baffling one. This particular battle focuses on the Macaw advance across the local river. Each side starts on opposite sides of the river and you start in the center. 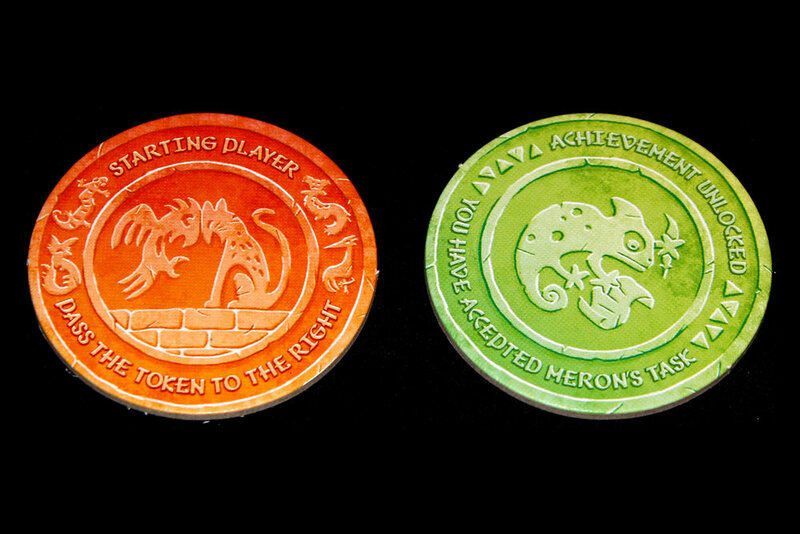 The game is played over multiple rounds, each with several phases: the Adventurer Phase, Army Phase, and Status Phase. I'll describe each in more detail. This is where your turns come in. You can perform actions to try and manipulate the armies from both sides in order to swing a more favorable outcome. Sometimes you don't want to do anything -- if you pass your turn, you may discard 1 Resource Card to draw a new one. All the cards have multiple actions on them, indicated by the card, movement, and fortification icons along with the text. You may only resolve one of those things per card, and then it gets discarded. Naturally, if during the resolution you find that you've drawn a Task Card from one of the armies' decks for a group without any units in play, remove it from the game and draw a new Task Card. Influence: This action allows you to reorder armies' Task and Ploy cards to better suit your designs. When you use this action, you may look at cards for the army with a unit on the same location as you (referred to as your companion unit). When you decide to do this, you may ask your allies to also discard cards with card icons on them; you may take the number of cards from the Task or Ploy deck pictured on the discarded cards. Once everyone decides to stop playing cards, you may reorder them all and return them to the top of the deck.If you happen to draw a Change of Plans Task, set aside the other cards you've already drawn and shuffle the Task Discard pile into the Task Deck. Continue drawing as though you hadn't drawn the Change of Plans card, then shuffle the Change of Plans back into the deck. That's not quite what the rules say, but it works well enough. Travel: You may discard a card with Movement Icons on it to gain that many movement points for the turn. Whenever you move to an adjacent space on your turn, you spend one of your available Movement Points. You do not have to spend them all at once (and you don't have to spend all of them), but any unspent points are lost at the end of your turn. Secure: You may discard a card with Fortification Icons on it to add Fortification Tokens to the space you're on or any adjacent space, one at a time (meaning they can be placed on different spaces). You cannot place them on rivers or fountains, and they cannot be moved once they're placed (unless otherwise stated). Like movement, you do not have to spend them all at once (and you don't have to spend all of them), but any unspent tokens are lost at the end of your turn. 3 players: Draw 2 cards if you're currently the Start Player; 1 otherwise. Naturally, if the resource deck runs out of cards, shuffle the discard pile to form a new deck and keep drawing. If that's also empty, then, well ... tell your allies to play more cards. Just as some solid advice from the rules, flip and read both armies' Ploy and Task Cards before executing either one. Move: Units will attempt to move a space closer to the enemy in the direction of their direction marker. Units cannot move into the same space as enemy units, and if this movement would put them no closer to the enemy, they do not move. Fun thing is that if you're sharing a space with a moving unit, you can move with it for free. What fun! Strike: Here's the complicated one. This one has the active group attack any unit (your adventurers don't count) within its range (the target icon on its unit card). It prioritizes the closest enemy (straight ahead, then scan in a clockwise circle), then the most damaged enemy, then the lowest ranked (fewest stars) enemy. If you still can't pick one in particular, roll the die and assign it randomly.When you attack, you deal damage, usually, equal to the bow / sword icon on the unit's card. This may be boosted by shatter, which is given to enemies standing on river spaces. It may be reduced by cliffs and towers that have a defense point on them, as well as Fortification Tokens you've placed previously. Since these effects reduce incoming damage, if a unit is being attacked by multiple other units, add the attacks together and treat them as one attack. Each shatter increases damage by 1, each defense decreases damage by 1. For each point of damage that they still have unresolved, the unit gets a pink Damage Token placed next to them. If that ever exceeds its health, it is defeated and removed from the game. 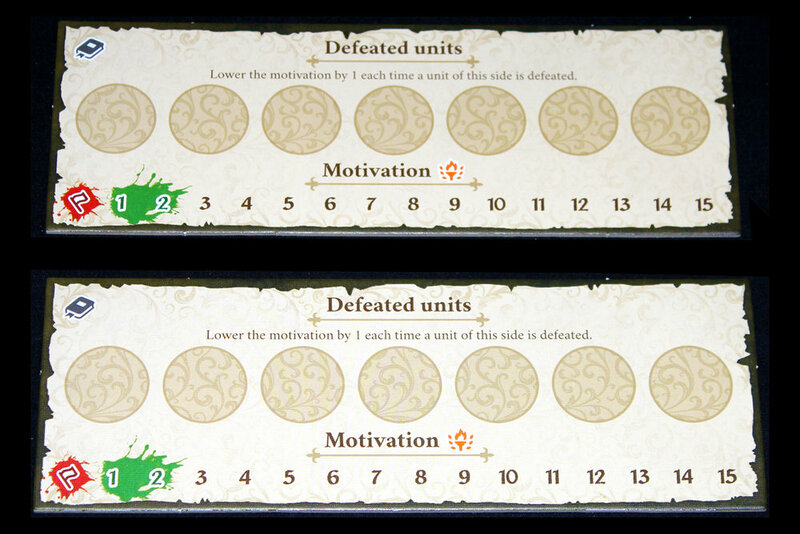 Decrease its' side's motivation by 1.If you happen to accidentally defeat the last unit or the last leader of a side, their motivation immediately drops to 0. You lose, and so do they. Try to avoid that outcome. There aren't really major ones, which is nice; it just distributes more of the cards throughout players' hands, as of the first scenario. It's totally possible that eventually this will no longer be the case, which is kind of interesting, but who knows! I certainly don't. It's even super fun solo, which is nice, but it's definitely harder to get places. Probably a slight preference for it at two? But it's very slight; I've been considering a solo campaign with my ... copious free time, but I keep not doing it because I don't actually ever have any free time. Manipulate the decks. You're not just going to need to set it up to Revoked every so often; you're going to want to have units waste Cover actions, units Strike from out of range, and units accidentally buff themselves, only to Move. These armies need to be haphazard as all hell, and with your influence they certainly will be. Similar to other cooperative games, you don't want these armies to be allowed to act randomly (unless it doesn't matter). Know what's available, and then make sure you spend some time limiting the negative possibilities. You may even want to avoid the Revoked if they're already at low Motivation; don't risk them hitting 0 and surrendering! Watch for the ebb and flow of the attacks. If a set of units has Striked a lot, it means they probably won't for a bit; it's either time to eliminate them or time to pull them back, depending on what you need. Remember how many cards of each type are in the decks. You'll also need to sort of ebb and flow so that you're not letting one side overwhelm the other; that's a bad mistake to make this early on in the game. Don't forget about terrain bonuses / penalties. Again, the fortified tower also provides motivation as long as there's a unit in it. Taking that unit out and then setting them up to be defeated just doubles the motivation penalty that that side takes. That's sometimes really good and sometimes absolutely terrible. It's important to know which is which. Also, some units can gain stealth, which means they can only be attacked from adjacent spaces. That can sometimes throw you off; watch out for that. Honestly, just keep the leader out of the fight. You really cannot risk getting them killed; I don't even know how that affects the game, but I'm positive you're not getting off scot-free if you do that. Remember that some units do not move.That's a problem you can fix yourself, if you're feeling enterprising, but they might just not have Move Task Cards. If that's the case, they're not budging. Account for that in your planning and strategy, otherwise you're in for a nasty surprise. The first scenario is a good warmup. I've played a bit further and it's a good way to introduce you to the concepts of the game while you're still ramping up on how to play. I really like it and I would recommend it to others. I think Fog of Love still has my vote for best tutorial of all the games I've played, but this is a solid introduction. I've played it a few times to get a general feel for the mechanics, as well, and I think it's a great way to get started. I really like the Daimyria world. It's got nice worldbuilding and I appreciate how it hooks into the Dale of Merchants games. If you're interested in their backstory at all, this is definitely worth playing, especially with the Dale of Merchants collection coming up soon. Solid cooperative play. Each player has some control over what they can do on their turn (because many actions require you to share a space with another army) and other players can chip in on certain actions. It's got some vulnerability to one player attempting to dominate, but if that starts to happen, just make a firm "no revealing or discussing cards in hand" rule, like for Pandemic. That usually solves the problem. Really great art. Sami is a super talented artist, and the work he put into making the game vibrant and colorful pretty much shows everywhere. It's a really good-looking game. The campaign decks are really well-organized to avoid spoilers. The major issue I had with The Rise of Queensdale was that all the spoilers were just on one big page that you had to try and avoid when you were looking for something specific; this has sealed boxes, sealed envelopes, and wrapped decks so that you can't really sneak a look at anything; it's possible to figure out some things (there are some minis you can see in my photos that aren't used in the first scenario), but the actual details are pretty well-hidden. Change of Plans with small decks can be kind of annoying. The best fix is just to shuffle the deck, draw the new cards you need, and then shuffle Change of Plans back in. It's a bit quicker than drawing Change of Plans every time because you're bad at shuffling, like me. It's a bit weird, conceptually, that your goal is just to help the armies kill each other just the right amount. I get that you kind of need that from a gameplay perspective, but that's definitely given me pause a few times while I'm playing. Oh well. The difference between the gear bottom and the star bottom is kinda nuanced. There's not much that can be done now but having a midpoint between the gear and the circle (which is what I think the star was trying to do, but the edges are a bit too pronounced) might alleviate some of that confusion. I've played with people who have struggled a lot with trying to differentiate between those two, which is a problem when they're also the people in charge of setting up the game. Whoops. Overall, I'm really excited about Dawn of Peacemakers! I've really liked what I've played of it, so far, and I'm looking forward to seeing how the story continues. 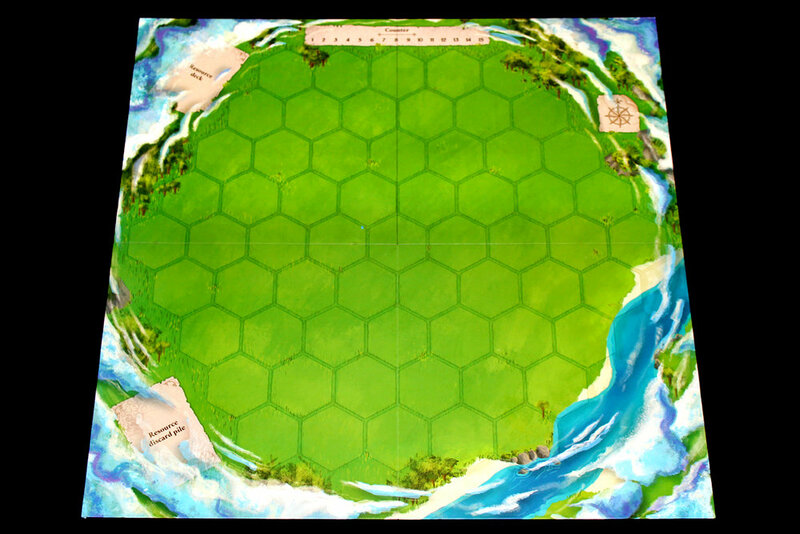 For players hitting it for the first time, you'll find some hybrid of a wargame and a resource management game; you're managing both sides of the conflict and making sure that they gradually wear each other down. The game does a good job of helping you understand (sometimes in a trial-by-fire sense) that if you allow the pendulum to swing too heavily in one direction, you'll end up letting a leader die or one side get routed. There's an interesting idea of balance that the game tries to achieve, and I think it does a pretty good job leading players towards it. Plus, it's got fantastic art, an interesting story (from what I've been able to glean of it so far) and a neat gradually-unlockable campaign mode. If you're looking for a new cooperative campaign and you want to try something a bit different than the usual or you're a huge fan of the Dale of Merchants series and you want to dig in a bit deeper as far as the lore is concerned, I'd say that Dawn of Peacemakers is certainly worth checking out! I've really had a lot of fun with it and I'm looking forward to having time to complete the entire campaign, eventually, probably, hopefully. If you enjoyed this review and would like to support What's Eric Playing? in the future, please check out my Patreon. Thanks for reading!